The unique curved back means it takes up very little kitchen surface. Well built too. Quite expensive - however it does work very well. The Whirlpool Max 25 range is available in silver and red, and features a unique curved back design, which enables you to push it deep into a corner. This handy space saving design is ideal for those with smaller kitchens - it takes up far less room than a regular microwave oven. The 13 litre capacity actually provides the same amount of usable space as a 20 litre model, complete with a 28cm turntable which should fit the majority of plates and dishes. The controls are located to the top of the microwave, rather than to the side, to save yet more space. Seven different power levels are provided, going up to a maximum of 750w, as well as a healthy steam option for fish and vegetables. Whirlpool's 3D distribution system cooks really well, providing uniform heating, thus eliminating cold spots and uncooked areas. 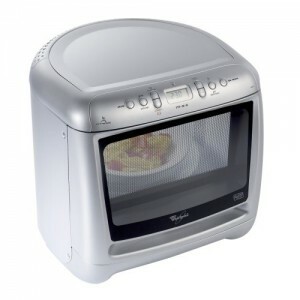 Our testers really liked this silver microwave oven - it cooks really well, and takes up very little room. 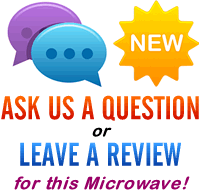 The build quality feels solid, and based upon Whirlpool's reputation, we can't envisage any issues with reliability in the long run. The Whirlpool Max 25 Silver is very compact, and feels well built - if you have got much room in your kitchen, then the Whirlpool Max 25 is well worth looking at. It performs well, takes up very little room, and should prove to be reliable. Features a unique space saving design, and it's curved back allows it to be pushed back deep into corners. Silver Finish to the exterior. Jet Start, with it's one touch operation, there's no need to set power level and time separately. The Whirlpool 3D distribution system gives uniform even heating throughout the cavity avoiding cold spots. The Jet Defrost system also utilises 3D distribution system defrosts 7 times faster than a conventional microwave. This microwave is also available in red. The Whirlpool max25 is showing 37.5 cm wide. I have a very restricted space in my motor home for this unit so want to be absolutely sure it will fit. can you please check the measurement across the front for me. the height and depth is not an issue, just the measurement across the front. If you know of any other models at 37 cm across I would be interested in doing a comparison before I purchase.